Since the Trayvon Martin shooting in Sanford, Fla., made headlines, various commentators have called on states to repeal their “Stand Your Ground” and “Castle Doctrine” laws. New York mayor Michael Bloomberg has called Stand Your Ground a “license to murder.” However, these laws are reasonable protections for citizens who defend themselves, and in fact they are unlikely to determine the fate of Martin’s shooter, George Zimmerman. States without these laws typically impose a “duty to retreat.” This means that when a person is attacked, he may not fight back unless he is unable to get away safely. A Castle Doctrine law removes this duty on one’s own property, and a Stand Your Ground law removes this duty in public places, allowing victims to meet force with force. In Florida, victims may assert immunity from prosecution under Stand Your Ground — but they have to prove to a judge at an evidentiary hearing, by a preponderance of the evidence, that they acted in self-defense. #ad#These laws typically include safeguards to avoid abuse. For example, the Castle Doctrine sometimes does not apply to conflicts between two people who live in the same house. And Florida’s Stand Your Ground law justifies lethal force only if a person reasonably fears death or serious injury. It also does not apply if the alleged victim was engaged in illegal activity when the attack happened. It is unsurprising that Stand Your Ground came under fire; when the police initially refused to arrest George Zimmerman, they claimed that Zimmerman’s self-defense claim was too difficult to overcome. But the special prosecutor is pressing second-degree-murder charges against Zimmerman, and it seems unlikely that the lack of a “duty to retreat” will affect the outcome. To justify his claim of self-defense, Zimmerman says that Martin attacked him without provocation, and then knocked him down and beat him. If this is true, Zimmerman had no ability to retreat — and thus would have had no duty to retreat even under the old law. If something else happened to spark the physical confrontation and Zimmerman was the aggressor, his behavior was likely unlawful — a fact that, again, removes him from the protection of Stand Your Ground. The only effect the law is likely to have is to allow Zimmerman to assert immunity on self-defense grounds in a pre-trial hearing, before his case is heard by a jury. The Martin case aside, some have noted that many prosecutors dislike Stand Your Ground. But as Reason’s Jacob Sullum has pointed out, this is unsurprising: The entire purpose of Stand Your Ground is to make it more difficult for prosecutors to obtain convictions in cases where self-defense may have occurred. For similar reasons, critics are wrong to assume it’s problematic when “justifiable homicide” rulings increase following the enactment of Stand Your Ground — in many of these cases, justice was served. What’s more, justifiable-homicide trends are not markedly different in states with and without Stand Your Ground, so it’s unclear that the law even has this effect. 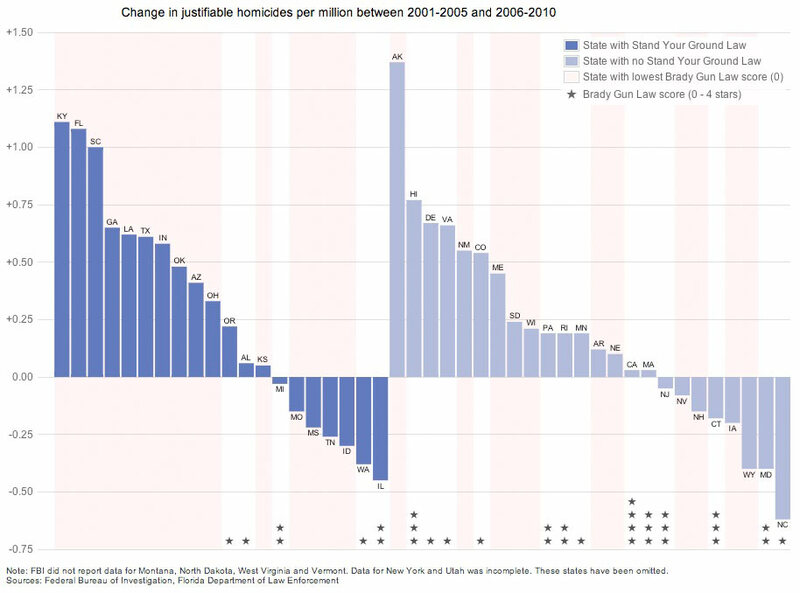 It’s also worth bearing in mind that despite doubling over the course of the previous decade, nationwide justifiable homicides totaled only 326 in 2010. The typical year sees 16,000 total killings. Other commentators have turned to specific cases as proof that Stand Your Ground is problematic. Some of these cases involve murky situations, and the government simply failed to demonstrate that self-defense did not occur. #page#There have been cases, however, in which Stand Your Ground has led to questionable rulings. In one recent Florida case, a man chased a thief who’d stolen his car radio for more than a block. When the thief swung a bag of radios at him, the man stabbed the thief to death, returned to his apartment to sleep, and later sold two of the radios and hid the knife. Despite Stand Your Ground’s requirement that someone reasonably fear death or great bodily harm before resorting to lethal force, and despite its seeming highly likely that the thief was trying to escape with his plunder rather than maim or kill his victim, a judge granted the stabber immunity. #ad#It was immediately clear that the problem was the ruling, not the law: “How can it be Stand Your Ground?” a homicide investigator who worked on the case asked in bewilderment. “It’s on [surveillance] video! You can see him stabbing the victim.” If Stand Your Ground can be further clarified to prevent abuse, it should be, but any law can lead to injustice if its text is blatantly disregarded. Simply put, it is unreasonable to demand that crime victims go out of their way to avoid fighting back. Stand Your Ground and Castle Doctrine laws remove that demand, and the case of Trayvon Martin should not inspire their repeal.